The world of electronics is in a continuous quest for finding low energy alternatives to current silicon-based electronics. 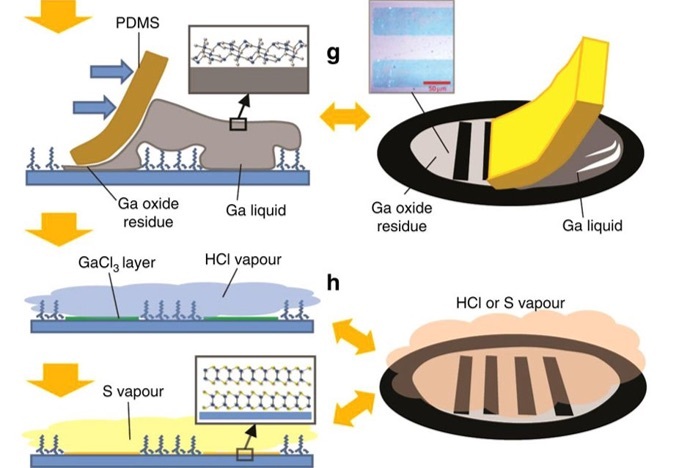 It is expected that atomically thin (two dimensional – 2D) materials offer the sought after alternatives, paving the wave for future low energy electronics. A significant portion of CASLEO research is focused on such investigations. Ref: Nat. Comm. 8, 14482 (2017). Figure presents the formation of two-dimensional materials from a liquid metal reaction environment.